Warming up is a very important part of oboe playing. The reed, embouchure, and air stream must work together in order for you to achieve the best sound combined with the best attacks. These oboe warm up exercises are great for improving all three of these things. In most cases, the examples should be played with a metronome very slowly, about 60 to the quarter note. Listen carefully to how you are starting the notes. They all should have as clean attack as possible. Think of starting each note with the sound of “Taa” or “Tee”. As Marcel Tabuteau states in his “Marcel Tabuteau’s Lessons” recording by Boston Records, no “Gaa” no “Faa” “Kaa” or “Daa”. Don’t crack the note or accent it. If you would like to print out these examples, just “right Click” the image and save to your disk. Here is the first example. It may seem very easy at first, but it isn’t. You can tell an awful lot about how your reed functions with this test. Listen for intonation and make sure every interval is in it’s place. Blow through the notes. If your reed is not vibrating properly, or you are biting the reed, the low “D” will not sound. 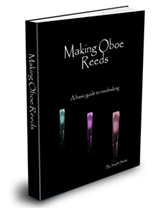 If you liked that one, why not try another oboe warm-up exercise?